I am a big fan of chair-side air abrasion. It is an incredible clinical tool to clean temporary cement off a tooth prior to adhesively placing a final restoration, prepare certain restorative materials for bonding and even complete some small cavity preparations. For years I have pushed through the inconvenience of the equipment for air abrasion due to the benefits it presents technically. In the last year I have found the solution to having all the advantages of air abrasion in the operatory, without the logistical challenges. The Etchmaster from Groman dental, is one of the best pieces of small equipment I have in the office. It is small and easy to hold. 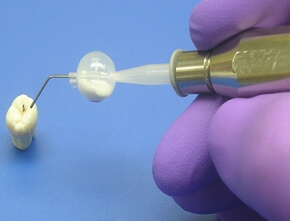 It connects easily to the line on your operatory equipment. The powders, which come in a wide variety of different particle sizes and types come in pre-filled plastic inserts with their own tip. You simply connect the Etchmaster tot he 3 or 4 hole line. Insert the appropriate pre-filled tip, pul out the tip and go. My most frequently used material is 30 micron aluminum oxide, but they also make small glass beads for cavity preparation, and sodium bicarbonate for removing stain during a hygiene visit. Add to this convenience that the price is right. My old air abrasion unit has been relegated to the lab and we use it to clean restorations. For more Discussion On Air Abrasion and Etchmaster visit Restorative Nation.